Review of Modern Haiku Volume 34.2 (2003). Review of Modern Haiku: Robert Spiess Memorial Issue (2002). Toward an Aesthetic for English-Language Haiku by Lee Gurga. 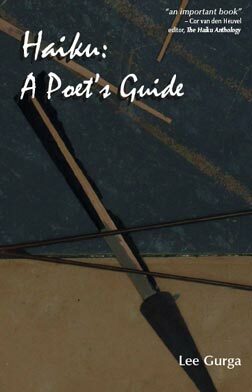 Haiku: A Poet's Guide by Lee Gurga. Marianna Monaco. Ouzel (James Arnold). Patricia Donegan. Haiku: A Poet's Guide by Lee Gurga. The following article was originally published in Modern Haiku Vol. 31, No. 3 (Fall, 2000). Copyright 2000-present, Lee Gurga. All Rights Reserved. As we approach the one hundredth anniversary of the first attempts to write haiku in English, perhaps it is a good time to reflect on where we have been and where we might be going. Whatever course on which we try to move haiku along is going to be based on the idea we have of haiku, and how this idea of haiku responds to changes in contemporary life and poetry. It is unavoidable that we should have some idea of what haiku is. The question then becomes what kind of an idea should it be? I want to review some of the ideas that are available to us in hopes of deepening our understanding of the kind of haiku that will develop from them. If we are to meaningfully discuss haiku, we must address the question of what it is we are talking about when we say "haiku." Several possible postures are available. The first and most widely accepted is that anything in seventeen syllables is haiku. What is presented in these seventeen syllables is usually a display of wit or an intellective statement of some sort. This is the posture that produces things such as so-called "corporate haiku," Haikus for Jews, and the like. A survey of the Internet quickly demonstrates that vastly different things are called "haiku" and that they seem to have little in common other than their brevity. This might lead us to conclude that brevity is a defining characteristic of haiku and I believe it is. Beyond this characteristic, these constructs seem to have little in common with the Japanese haiku from which they are supposedly derived. While I will not argue that these efforts are "not haiku," in the broadest sense, they are not significant to those who are working to develop haiku as an art form. What sort of art form shall we have? And how will we achieve it? I suppose the most inclusive definition of haiku is that "haiku is anything that the writer or reader or viewer considers to be haiku." I include "viewer" here because some things called haiku are visual or infraverbal. While this definition may be the most encompassing and liberal, it certainly is not very helpful for the purposes of exploring an aesthetic for English-language haiku. The problem is that if "anything is haiku" then any aesthetic will do. This leads to the question: "Is more than one haiku aesthetic possible?" There seems to be no choice but to answer this question in the affirmative. Where does that leave us? I believe it leaves us free to choose an aesthetic. The aesthetic I have chosen to discuss this morning is one that looks back over haiku's 300-plus year history and attempts to build a poetics based on the most significant poems that have been written over that time. However satisfying any aesthetic may be intellectually or emotionally, the only test that matters is whether or not it produces poems of significance. This is the kind of haiku that I appreciate. When I read it, I say to myself, "I wish I had written that!" The question then becomes, how does one approach the writing of this kind of haiku? Is there, as has been suggested, a state of mind conducive to writing haiku? Are there any kinds of perceptions that are peculiar to haiku? Is haiku to be written from the perspective of the upper case "I"? The lower case "i"? Or perhaps the spiritual "third eye"? In suggesting the basis for an approach to haiku, one could do worse. A new era in the consideration of haiku aesthetics was ushered in by Haruo Shirane's fine book, Traces of Dreams (Stanford University Press (1998)). It presents Bashō not as a Zen patriarch, but as a literary man participating in a vibrant life involved with his contemporaries. One cannot claim to be writing today's haiku without addressing the issues raised in this book and in Professor Shirane's essay "Beyond the Haiku Moment," in Modern Haiku, Volume 31, #1. I believe Professor Shirane has done us a great service by stimulating discussion of these issues, and I would like to touch on each of them. How to resolve this dilemma? Fortunately we have William J. Higginson and Professor Shirane himself to thank for stretching our understanding of haiku as only one part of a larger tradition of poetry called haikai. Haikai includes all of the linked-verse tradition from which haiku developed: the imaginative linked verse as a whole, the opening stanza from which haiku developed as an independent form, and the interior verses from which senryu and other poetic expressions have developed. If we see all of what is presented as "haiku" as having developed from this larger haikai tradition, it is much easier to resolve the issues raised by the differences between the various kinds of "haiku" we see today. Broadly speaking, we can view all of haikai as a pyramid composed of three basic elements: zappai, senryu, and haiku. We are all familiar with the terms senryu and haiku, but what is "zappai"? In Japanese poetry, zappai includes all types of seventeen syllable poems that do not have the proper formal or technical characteristics of haiku - the cutting word, season word, rules for the use of postpositional particles and specific verb endings. It was a popular form of entertainment in the Edo period that includes many kinds of linking games, including the one from which senryu developed. If we look at all of what is presented today as "haiku," a large number of so-called haiku are, like zappai, imaginative or imaginary, wit-based poems that are written or shared for the entertainment of the reader and writer. Unlike haiku, these poems often have no relation to nature. Unlike senryu, these poems make no attempt to distinguish between the imaginative and the imaginary. This includes things like spam haiku, sci-fi haiku and their ilk. While it is appropriate to recognize these poems as part of the haikai tradition, they are not haiku except in the sense that they share with haiku the characteristic of brevity. In the past, I have proposed the use of the term kyôku to describe these poems. Kyôku means "mad verse," and these poems certainly share madness with the most imaginative haikai of the Japanese tradition. In fact, one could go as far as to say that they represent the true legacy of the haikai that Bashō inherited, and out of which haiku developed as an independent art. But, as it turns out, kyôku itself is part of this larger imaginative tradition called zappai in Japanese. While zappai were recognized as a form of poetic entertainment, they were not recognized as being as high an art as either haiku or senryu. Zappai thus defined may be a handy label for the majority of what is written today in the name of "haiku." If they are not the majority, they are certainly the kind of "haiku" that command the most attention in the media. Zappai, then, form the base of our pyramid and account for most of its volume, either literally or figuratively. Zappai, as a sort of poetic entertainment, provide the point of entry for many poets into the haikai tradition and the writing of zappai enables people to develop the skills and interest for subsequent exploration of other elements of this tradition. While the term zappai is unfamiliar to most American students of haiku, I believe its adoption will provide us with a useful category to help us understand that while much of what is being written today under the name of haiku is not genuine haiku, it is still a legitimate part of the haikai tradition. Those who object to the introduction of this term might simply want to use the term "pseudo-haiku" to categorize the poems I am describing here. Resting on this broad base of zappai are senryû and haiku. Like zappai, senryû are derived from the interior stanzas of haikai linked verse. Like zappai, they are imaginative, but what distinguishes them is that they are not dominated by an imaginary element. They have a commitment to truth, in the case of senryû, the truth of the human condition. They also share with zappai a wit-based humor, which they use to convey this truth to the reader or listener. Their combination of wit and insight allows them to advance from the realm of light verse to that of poetry. However, since their purview is restricted to the human realm, they often lack the potential for universal significance that the finest haiku can attain by relating the human condition to the larger issue of our place in the universe. This is what haiku can attempt and the finest haiku achieve. Through the elements of brevity, juxtaposition, observation of nature, insight, and humor, haiku give us a view of the unknown and the unknowable. This is why I place haiku at the apex of the metaphorical pyramid. The fundamental difference that separates haiku and senryû above from zappai below is a commitment to truthfulness. Using this schema as a basis, I am attempting to limit what I am referring to as "haiku," so I can discuss the concept of an aesthetic meaningfully. I don't believe it is possible to develop a single aesthetic that will cover all the elements of haikai. Having given some thought to the state of mind necessary for haiku, another question to consider is the subject on which the poet's mind is focused. One of the original and enduring characteristics of haiku is the seasonal or nature reference. In addition to brevity, this nature reference has been an essential element of haiku since its beginnings. In its original role as the opening stanza in a linked poem, haiku as hokku not only evoked the season, but it evoked the particular season in which the poem was being composed. With these seasonal references, the Japanese have created a rich poetic texture over a thousand years and more - and the seasonal reference invites both poets and readers to weave these perceptions of the seasons into their lives and to weave themselves into this rich brocade. It is true it is not our tradition, but then neither is judo or kendo or Zen, yet we have embraced all of these. The tradition may seem contrived and of course it is - all human culture is contrived - even as it may try deliberately to avoid contrivance. Emphasis on the season and sensitivity to the immediate present is a large part of what makes haiku what it is. It has been suggested, however, that this will not do for our age. The thinking seems to be that seasonal images are too local and, for people living in urban environments, a seasonal requirement is both unreasonable and artificial. There is some truth to these arguments, but I do not believe they form a real impediment to the use of seasonal references in contemporary haiku. Wherever one lives, the signs of the changing seasons are present, even if unnoticed by those focused on the drama of their personal lives. This fine poem goes beyond wit to produce a poem of great resonance, evoking the season even in an environment where it is not overtly visible, but in which its presence is is nonetheless felt by the poet. the presentation of this event in the present rather than the past. In addition, he discusses the use of the fundamental haiku technique of internal comparison. Other lists can be devised, but I believe these elements can still be considered the core issues of haiku composition. While technical elements as a whole are not pertinent to this discussion, it is important to understand that there is one technical element that is more important than the rest. The internal comparison that Henderson considered an essential technique of haiku results from the juxtaposition of two or more images. How crucial this element is to haiku is indicated by the Kodansha Encyclopedia of Japan, which includes the cutting that results from the separation of the images in haiku as one of its three defining elements. When one sees a haiku or pseudo-haiku that begins with a capital letter and ends with a period, one can be fairly certain that the writer has missed this important point. If English-language haiku is to be a genre of poetry rather than merely a form of light verse, we must consider how to appropriately achieve depth of expression. This question leads us into the realm of metaphor. In his Modern Haiku essay, Professor Shirane writes, "if haiku is to rise to the level of serious poetry, literature that is widely respected and admired, that is taught and studied, commentated on, that can have impact on other non-haiku poets, then it must have a complexity that gives it depth and that allows it to both focus on and rise above the specific moment of time." This is an important and accurate observation. If we are to have a haiku that is to become a serious literary form, it is clear that we must go beyond the simple presentation of "moments"; something more is needed. The question is, what should that something be? How are we to achieve this depth? Or to take the matter one step further, how are we to achieve this depth while our verses still remain haiku? Shirane suggests several devices that can be used to increase depth in haiku. One is illusion or fantasy. Another is allusion, references to culture, to the literary or historical past or to the present. In other words, personal experience plus engagement with literary tradition through allusion equals literary haiku. This is certainly a possibility, but is it the best one? Is it the only one? First the question of allusion. There is no doubt that allusion can be an exceptionally effective way to increase the emotive power of a poem. But for English-language haiku, the question becomes, allude to what? Poems of the English-language canon? Nature writings of the transcendentalists and after? In the one example Shirane gives, the allusion is to a poem by Bashō. Should we be alluding to the Japanese classics in our haiku? More contemporary Japanese haiku? Early English-language haiku? Allusion to individual poems in the haiku tradition is certainly a valid suggestion. But if it is appropriate to invoke the poems of a tradition, why not invoke another element that is even more fundamental? Shirane gives an inspiring account of the role of the seasonal reference in Japanese haiku, then simply dismisses the seasonal reference as an important element of allusion in English-language haiku because "the connotations of seasonal words differ greatly from region to region in North America, and generally are not tied to specific literary or cultural associations that would be immediately recognized by the reader." He goes on to say "English-language haiku therefore has to depend on other dimensions of haiku for its life." But is this really true? Shirane's dismissal of the seasonal reference is convenient for the thesis of his paper, but does not seem to consider what is most distinctive in the haiku tradition: the kigo or seasonal references that characterize them. It is puzzling that the most obvious possibility for allusion is dismissed out-of-hand. Let us take Shirane's advice and use the tool of allusion in our haiku, but let us not forget that the seasonal reference is the most powerful and fundamental tool available to the haiku poet. It gives both depth to personal observation and within the literary tradition. In a sense, the use of kigo or seasonal references is the haiku tradition. Along with brevity and juxtaposition, it helps to define haiku. If we are going to use allusion, let us not forget haiku's most powerful allusive element. Is it a problem that connotations of seasonal words differ from region to region, or is it a potential source of additional richness for our haiku? Is it a problem that seasonal words are not tied to specific literary or cultural associations, or does this not give haiku the privilege of enriching our traditions as it develops? The use of the seasonal reference enables us to participate in the centuries-long haiku tradition. It also helps one explore whether this tradition can add a meaningful element to one's life or whether one can add meaningfully to the tradition. In other words, each use of these seasonal references is a test by which the viability of the haiku tradition is measured against the real life of each poet. The seasonal reference takes the poem beyond the merely personal, and enables us to align our individual experiences with the ever-changing but eternally recurring cycles of the natural world. This is the haiku tradition. Why insist that haiku become something else? Why not explore and enhance it? Why not let the experience of thousands of poets over the centuries enrich your life and perhaps as a side effect, enrich this tradition yourself? Allusion is an important poetic device, but it is only one of the many tools available to the haiku poet to increase depth and resonance. Traditional poetic devices like simile and metaphor have been used effectively in both Japanese haiku and North American haiku. That they have been used by the early masters of haiku can be demonstrated. The advantages of their use in haiku is the same as in any other kind of poetry - they permit the poet to introduce unexpected associations, and thereby allow the poet to convey his or her individual insights to the reader in a nonrational, nondiscursive way. In this poem, his heart's claustrophobic reaction to confinement in a tunnel is captured artfully through its identification with the violence of an autumn storm. On the other hand, the danger inherent in the use of these devices is that their use will become an end in itself, that the poem will become merely an exercise in poetics rather than a poem with real depth. After all, what gives a poem resonance is not the presence or absence of poetic devices, but the ability of the poem to create an impression of significance in the heart of the reader. The use of simile and metaphor has the same disadvantages of other devices like allusion or the artificial use of seasonal references - they offer the poet a "lazy way out" of engaging the material of the poem directly. They introduce the dangers of stereotype in place of insight and fancy in place of imagination. It is true that skillfully constructed but insignificant poems can be judged "technically admirable" by the reader, but after that wave of admiration is passed, the poem will be forgotten unless those admirable techniques are used to convey something meaningful. While poetic devices can increase the depth and power of individual haiku, it is also true that the use of overt simile or metaphor can have a limiting rather than expanding effect. In my own experience, the poems that have the greatest depth are those that operate successfully on the literal level as well as being potentially metaphorical. This more subtle kind of metaphor has been discussed by Paul O. Williams in a talk titled, "The Question of Metaphor in Haiku" presented at the Haiku North America Conference in 1993, and published for the first time in his new book, The Nick of Time: Essays on Haiku Aesthetics (Press Here, 2000). In his talk, Williams coins the term "unresolved metaphor" to characterize the kind of subtle metaphoric suggestion that he finds most effective in haiku. The technique of juxtaposition makes it nearly inevitable that haiku will have some implied comparison between the elements of the poem. That these elements can be interpreted metaphorically as well as literally adds depth and resonance to many of the finest haiku. Professor Ethan Lewis of the University of Illinois in Springfield has pointed out to me that what I am really advocating through the use of unresolved metaphor is symbolism. And, in fact, the recent Matsuyama Declaration makes the point that Japanese haiku is "in essence, symbolic poetry." This is not the arcane, personal symbolism of the tortured poet wasting away in his garret, but the potentially universal symbolism of the poet participating in contemporary life and culture. On the surface, this poem presents a simple scene from nature, something that many of us have experienced. Perhaps Hackett is standing on a bridge over a swiftly flowing mountain stream. But awareness of Hackett's lifelong pursuit of Zen principles opens this poem to another, deeper (no pun intended!) interpretation. The fish could easily be seen as a Zen master. Moving, yet motionless. In the stream of life, but unaffected by the currents that carry others away. Facing upstream in a world that is moving downstream. This additional level of insight provides the richness that makes this haiku more than merely what David Cobb calls a "nature note." One can say the best haiku are the ones with the best allusive quality, with the most wit, or with the best use of literary and poetic devices. Or perhaps the ones with the best combination of allusion and immediacy, ones in which a moment is captured in skillful language, that can be interpreted equally well at the literal level or at a higher, metaphoric level. To go back to haiku's "Zen" roots in Blyth and the Beats, one can say that the best are the ones that preserve the balance of spontaneity and self-watchfulness. Two Important haiku manifestos have come from Japan recently. These manifestos, from the First Symposium on Contemporary Haiku in Tokyo (July, 1999) and the Shimanami Kaido Haiku Convention in Matsuyama (September, 1999) hope to influence the direction of international haiku. What these two manifestos have in common is the suggestion that the Japanese concept of the kigo might not be suitable for international haiku. Both manifestos suggest the possibility of replacing the Japanese kigo with a culturally appropriate "keyword." The Japanese are correct in believing that haiku must adapt to different languages and cultures as it becomes a truly international art form, that the rigid and culturally bound system of Japanese kigo is probably not adaptable to other languages and situations. By releasing haiku from the specific seasonal associations of Japanese culture, the keyword concept can help to speed the internationalization of haiku. However, I am concerned that the keyword concept might be misunderstood, and that this potential misunderstanding poses a grave danger to world haiku. If we are to have keywords in place of kigo, I believe it is important that these keywords retain their seasonal character, or at least that they retain some significant element of non-human nature. For example, if we are going to have non-seasonal keywords, it would be difficult to object to "spam" as a legitimate keyword. Thus "spam haiku" become real haiku. Surely this is not what is intended by the poets who produced these manifestos, but it is a possible interpretation of their suggestion. This risks destroying international, not to mention Japanese, haiku by reducing haiku's subject matter to objects of merely human connotation of the most trivial sort. If haiku keeps a seasonal element, the keyword concept can potentially enlarge haiku, but if it doesn't, it risks diminishing the significance of haiku to the vanishing point. One of the things that sets haiku apart, and is a major part of its value, is that it encourages people to go beyond the merely personal, beyond the merely human-centered. It encourages them to view themselves and their perceptions as a part of a larger whole. The suggestion that people should be satisfied with strictly human-centered haiku risks trivializing haiku rather than expanding its boundaries. Every living art form has current issues that it is exploring. Some might simply be of interest to practitioners, while others might be vital to the survival of that art form. In Japan, the primary problem is an over-conservatism, an over-dependence on tradition and a lack of individualism. In the West, the problem is nearly the opposite - a tradition that could be said to hardly exist at all and an almost pathological excess of individualism. In Japan, centripetal forces put haiku at risk of collapsing on a conservative center. In the West, centrifugal forces threaten to make the term "haiku" meaningless. One cannot apply the same cure to different diseases and expect efficacious results in both cases. A crucial American deficiency is an incomplete or flawed understanding of what haiku is. Excessive individualism leads to the posture of "whatever I want to call haiku is haiku". The keyword concept is a potentially valuable contribution to international haiku. Non-seasonal haiku can be powerful. But the wholesale replacement of seasonal references with non-seasonal keywords risks transforming haiku back into the haikai from which it developed. Haiku master Kaneko Tohta has said that he wants to make haiku more democratic. This is surely a worthy goal. We should also try to make our haiku of greater depth. It is difficult to see how either of these goals can be accomplished by dropping the seasonal reference from haiku. There is no doubt that Japanese haiku has some serious problems. However, their problems are not our problems. We have to worry less about haiku becoming moribund than we do about its being stillborn. Assuming that Shirane is correct in saying that one of the fundamental purposes of haikai in its original manifestion was escape from reality, what purpose does it serve to return haiku to the same imaginative ghetto from which Bashō rescued it? As literary critic Gerald Graff points out, purely imaginative literature, "may stimulate escapist fantasies rather than critical thinking - all the more probably if these models are inserted into an already uncritical, fad-worshiping mass culture." (in Literature Against Itself, University of Chicago Press, 1979, reprinted by Elephant Paperbacks, 1995, p. 99). In the haiku world today we are experiencing a clash between realism and idealism. Idealism - [which is] derived from the tradition of William Blake, Vachel Lindsay, the dadaists and surrealists - values personal vision and action, and is oriented toward the future. Realism - following the tradition of Pound and Eliot - values perception and is oriented toward the present. The realists tend to be older and more conservative, while the idealists tend to be younger and more impatient. Each side has its difficulties. The idealists, especially after WWII, have difficulty rationalizing a system based on personal vision. We have seen all too clearly the negative possibilities of political and social action based on personal vision. This could be best summed up by the German philosopher Adorno's observation that after Auschwitz to write poetry is barbaric. The realists, on the other hand, can be accused with some truth of collaborating in the preservation of a status quo that is full of injustice and oppression. Is it possible to reconcile these two opposing approaches? We all know that haiku is composed of two parts - perception and imagination. If we can keep these two in balance, perhaps we can create a contemporary haiku that has both spiritual and social meaning. What is unique about Japanese haiku is that it is both elitist - tied to a learned tradition - and democratic - accessible to anyone who wants to try his or her hand at it. I wouldn't feel too bad about American haiku if it followed this same course. To do this, it is not necessary that we imitate the use of kigo with its associations in Japanese culture. Wherever we are writing, we can use local references to the seasons to develop our own tradition. We can enlarge haiku by using additional non-seasonal keywords, but I would suggest that we consider restricting these keywords to non-seasonal images of nature. I am concerned that to go farther afield than this risks diminishing haiku. I don't think it is possible to construct a meaningful haiku tradition anywhere without the tether to reality provided by the seasonal reference. As many of you know, I am a dentist by profession, as was, if I might add Saitô Sanki, one of the premier haiku poets of twentieth-century Japan. I have a quotation hanging in my office that reads, "True understanding is actual practice itself." What I do is called "the practice of dentistry." A theoretical understanding will not do when one is confronted with a person with a swollen face. The ability to practice skillfully and compassionately is the only thing that is important. Likewise, a theoretical understanding of poetics will not necessarily produce good haiku. Only a poet can do that. So let us be careful of taking too much advice from people who don't write haiku. We should be grateful for the interest of admirable scholars such as Makoto Ueda and Haruo Shirane. Their erudition can make a great contribution to the development of American haiku by sharing knowledge of the haiku tradition that we do not possess. But whatever posture we assume on a theoretical level, let us test that against the actual poems produced. If proposals lead to better haiku, we should explore their ramifications. If not, then we shouldn't bother with them. Otherwise, what is the point of it all? If one takes haiku in English to be a short poem that presents images, one can follow this line of thinking to discern streams of contemporary haiku. One approach follows Pound's one-line definition of Image, "An 'Image' is that which presents an intellectual and emotional complex in an instant of time." (Poetry, vol. I, #6, March, 1913, p.200.) This defines an image as having a combination of intellective and emotional elements. The vast majority of Japanese haiku and the bulk of American haiku have been composed in this way. This "image" gives us the sort of haiku Shirane is proposing - haiku produced by a combination of attention to one's immediate environment and reference to one's literary tradition. This category, unfortunately, also includes all the intellective abominations in the West that have been produced in the name of haiku - often playful, usually cerebral poems that pay no attention to the immediate environment other than its human elements, poems that I suggest we categorize as zappai rather than haiku. If we make a slight alteration in Pound's definition, we get a second kind of haiku, one that may present us with a resolution to this dilemma. If we change "intellectual" to "intuitive", we have, "An 'image' is that which presents an intuitive and emotional complex in an instant of time." Today we have many people throughout the world writing many kinds of haiku. Let us continue to ponder the questions raised by their work. Are they good poems? Are they good haiku? The thoughts I have presented here today should not be considered rigid prescriptions, but rather as suggestions for further experimentation with haiku. I believe with Anselm Hollo that one should "doubt everything then doubt your doubt." I hope that some of these thoughts will prove fruitful for you and your haiku. This paper was presented at the Global Haiku Festival at Millikin University, Decatur, Illinois on April 15, 2000. Robert Spiess, and Michael Dylan Welch for reviewing an early draft of this essay. Their suggestions for clarifications and improvements have been invaluable. Order Modern Haiku (past editor Lee Gurga). Lee Gurga's Books on Haiku. The Essential Haiku: Versions of Bashō, Buson, and Issa edited by Robert Hass: The past-poet laureate of the U.S.A presents the lives, the prose, and 300 of the poems of three masters and inventors of the haiku tradition in Japan. The Japanese Haiku, by Kenneth Yasuda. Haiku Handbook: How to Write, Share, and Teach Haiku by William J. Higginson, William S. Higginson. Lee Gurga's article "Toward an Aesthetic for English-Language Haiku"
was originally published in Modern Haiku Vol. 31, No. 3 (Fall, 2000).